Happy Easter one and all! In celebration of the long weekend, I excitedly rushed home last night and baked some hot cross buns ready for my girls’ weekend away. 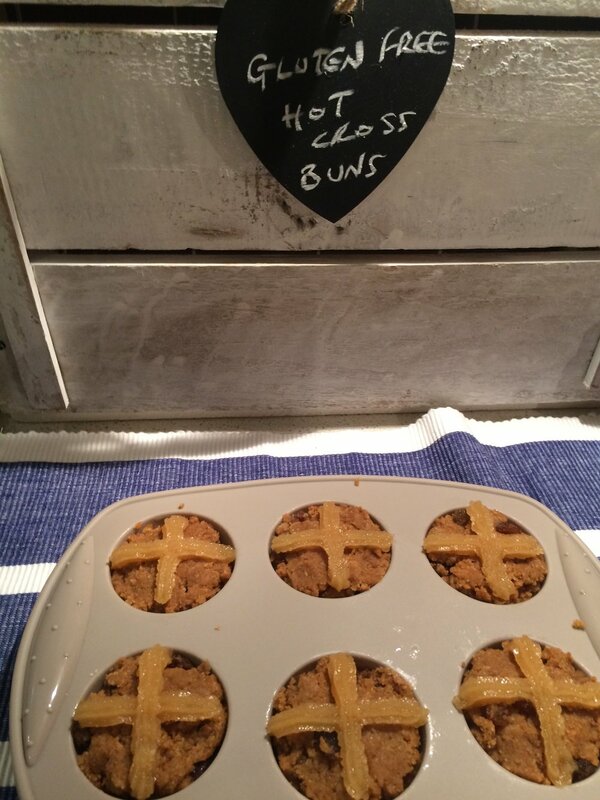 But these aren’t just any hot cross buns, they are SUPER HEALTHY gluten-free and sugar free ones! Just as delicious but guilt freeeee. Winner. Easter is traditionally a time to indulge and feast on carby, sugary treats but I always end up feeling bloated and low on energy afterwards. The gluten-free version are admittedly not as light and fluffy as your regular hot cross buns, in fact I would say they are pretty dense, but they taste delicious and are full of yummy spices which adds an extra depth. Grease a muffin tray with coconut oil. I would choose a silicon tray as they buns are much easier to push out at the end. Add the raisins, eggs, coconut oil and honey and mix to form a batter. Mix the batter together really well, making sure there are no lumpy bits, then spoon it into the muffin tray. 4. To make the cross mixture, in a separate bowl mix together the coconut oil, maple syrup, coconut flour and egg white. Pour this mixture into a piping bag (or a plastic zip-lock bag with one corner snipped off) then pipe a cross on top of each bun. Pop the tray into the oven and bake for 20 minutes until the buns are risen and slightly golden. Et voila! My buns were slightly overly golden on top (!!) but tasted just wonderful. I finished the buns off by sprinkling a little coconut all over as I love it so much! The mixture makes around 6-8 hot cross buns (depending on your tray size) and they are best enjoyed with a little butter and honey, or even some sneaky nutella. So that's Easter sorted for 2015!! I hope you enjoy the recipe. What do you like to bake over the Easter holidays? New recipes are always most welcome in my home!